A Mass of Christian Burial for Sister Mark Rumble, SSJ, was held August 11 at the Sisters of St. Joseph Motherhouse in Rochester. 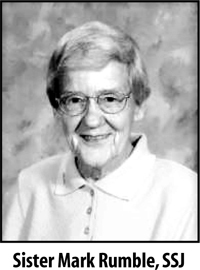 Sister Mark died August 6, 2018. Sister Mark spent 26 years teaching in the Diocese of Ogdensburg, including seven years as principal and superior at Holy Name School in Tupper Lake. She later taught for 13 years in Rochester at Our Lady of Perpetual Help and Guardian Angels Schools. In recent years, she was active in ministry at the Sisters of St. Joseph Motherhouse in Rochester. She celebrated her 60th Jubilee in 2013. Sister Mark is survived by her devoted nieces and nephews, as well as friends and her Sisters of St. Joseph Community. Contributions in her memory may be made to the Sisters of St. Joseph, 150 French Rd, Rochester, NY 14618 (www.ssjrochester.org).